A little surprise from Mateusz Skutnik, and probably the last game of the year: where is 2010? What were your 2009 personal favorites? Did I forget some really nice ones? Feel free to add your own suggestions in the comments! 2009 was also a productive bontegames year with no less than 3 bonte games that hit your browsers: Me And The Key, Must Pop Words and Full Moon. Watch out for more bontegames in 2010! A new Eyezmaze game is always a treat! Get ready to transform. Once again, you must venture back to the city of Black & White, but this time to bring to the city the spirit of Christmas which has long died along with the colour of the world: colour my fate. Minoto is still in a christmassy mood with his point and click game for this week: sent santa. The tealy have gone missing again. Can you find all 10 in Rosiana Dharmadi's find tealy 2? 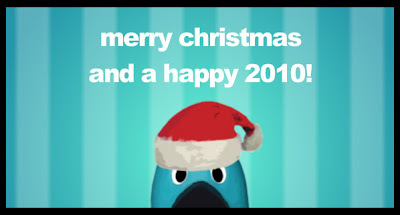 A merry Christmas and a happy 2010 to all of the bontegames visitors! Enjoy your holidays and stay tuned for more bontegames! Every day the same dream, an interesting experimental game by Molleindustria. Embark on a point and click adventure to help the Eremites of Helda rescue the Blue Seals from an Evil Poacher: Helda. Even though Christmas is coming soon, you are alone on a cold night field: Christmas escape 3 by Neutral. Reindeer of santa is this week's Minoto point and click exercise. Get ready for some more viking themed ice slicing in Nitrome's latest puzzler ice breaker, the gathering, a new addition to the ice breaker games. It's that Minoto time of the week again with a fresh point and click game from Minoto: santa hair. What do you see in the night sky? Find what pictures are hidden in the starlight. Pac and his girlfriend were enjoying a lovely day on the sea coast, until the UFO appeared that is. Help Pac to liberate his girlfriend in the mini-games packed pac vs alien. Jmtb02 and his elephant strike again. Guide your elephant through an ever-faster game of thinking, jumping, and saving girlaphants, but above all obey the game! Rotate and stack shapes, once more! Try to achieve perfect balance in the physics puzzler perfect balance 2. You're the ant explorer with big knowledge in the elaboration of magic recipes. Your mission is to find a new route on the outside of the anthill and to plant the seed at the dawn that will make grow the provisions plant. If you have 60 seconds to spare, why don't you find out how many ninja cubes you can collect. Help the smiley to reach the happy fox so they can be happy together in the physics-based puzzler fox'n'roll. Time to demonstrate your point and click skills in the new Tesshi-e room escape game: escape from bed room. Send as many treasures as possible into the water with a single cannonball without spilling any toxic waste in the pirate themed physics puzzler CCC pirates. Continuity is an interesting puzzle platformer in which you need to slide tiles into place to make corridors match and travel between tiles. You can swith between sliding the tiles and controlling the character by pressing the space bar.